If you just don’t have time to put these tips into practice, let us help! We would love to hear from you! Contact us at 918-749-9077! What are some strategies to get your kid to eat healthy? Make food fun, etc.? Whether giving them a hands-on experience or allowing them to make choices, involving children in the preparation and cooking process is important. Food can be inherently exciting for children because it involves the sensory experiences of touching, smelling, seeing and tasting. Instead of teaching a healthy versus unhealthy approach to food, I recommend emphasizing the importance of moderation, balance and variety. Teaching children that it is OK to enjoy all types of foods in moderation is a more meaningful lesson than pitching “good” against “bad” foods. Another strategy is to exemplify this food philosophy at home by modeling the way you eat in front of your children. If your child sees you enjoying a balanced meal with all types of foods in moderation, this message can go a long way for picky or resistant eaters. While parents are not the sole cause in the development of eating disorders, many girls and women connect the restrictive, diet-centered environments they grew up in with the development of their eating disorders. What do you do if you pack your kids healthy lunches and they don’t eat them? If the lunches you pack for your children resemble what they are eating at home, you might not hit as much resistance when it comes to them eating that lunch at school. If there are other issues with lunch at school, I encourage parents to talk to the school and share your concerns. Lunches have gotten earlier and shorter in many schools, so there may be other factors influencing your child’s choices, such as not having enough time to eat the lunch you pack. If you have concerns, share them; perhaps other children may benefit from changes being made. How often is it good for kids to get treats like cookies, fruit snacks etc.? It’s really going to look different for each child. There is a lot of scientific research about parents who restrict or promote a diet-centered food philosophy in the home, and this has been associated with children having lower self-esteem and who are also more likely to eat in the absence of hunger. Instead of telling your child that they eat too many cookies or fruit snacks, which can feel shaming and embarrassing for a child, point out that trying a new food may be exciting and suggest foods that you want to promote. If you place value on a diet rich in variety and moderation and model this at home, don’t worry about giving your child treats and allowing them to enjoy these foods as they would others. What do you do when you are teaching your kids to eat healthy at home, but they get unhealthy foods at other people’s houses? Consider these instances as a time to demonstrate moderation. Even if your child is eating something at a another person’s house that you might not serve at home, if the child is not allergic or intolerant of the food, it is not going to have any lasting, negative, or harmful effect on the child. What are some things you should not say to kids when trying to get them to eat healthy? Focusing on healthy versus unhealthy is a dead end because we eat food in combination rather than in isolation. Someone’s health does not come down to whether they had a dessert that day; but if they have had 10 desserts, that is obviously not moderation. Instead of emphasizing healthy or unhealthy, focus on the importance of variety. If a child is asking for the same food over and over and the parent wants to limit the child’s intake of that food, the concern really is rooted in that food not being eaten in moderation and encouraging more variety in the child’s choices. That being said, using statements like, “I’ve noticed you’ve been choosing a lot of food A, so today why don’t you choose between food B or C?” This can be a great statement for parents to encourage a child to make different food choices or try something that promotes variety. What if a kid just won’t eat vegetables? In these situations, take the emphasis off vegetables altogether and focus on empowering the child. One way to do this is to offer the child a choice of vegetables to try that week. Parents can take the child to the grocery store or show him or her pictures so that the choice feels exciting and hopefully elicits some curiosity. Another strategy that works is using pre-existing activities that the child already enjoys and linking these with vegetable choices. For example, if a child likes arts and crafts, creating a color wheel and having him or her group vegetables of like colors together can be exciting and take the focus off the vegetables themselves. Having the child choose a different color every week and identifying a couple of vegetables in that color category can be new and exciting for the child. If the child is reward-driven, giving them stickers or points for each new vegetable tried and providing an appropriate, nonfood reward at the end of a month or season can be effective. As parents, you know your child best, so find ways that engage or excite your child. In recent years, there has been much debate over diet vs. regular soda. For those in favor of diet soda, they argue it has zero calories and zero sugar compared to regular, which can help with weight loss. However, those that are opposed are pulling from emerging research indicating that diet soda is not conducive to weight control. According to the recommendations of the USDA Dietary Guidelines, non-nutritive sweeteners may reduce the intake of added sugar. However, the effectiveness as a weight management strategy is unclear. In 2005, a study conducted at the University of Texas Health Science Center found that the larger the quantity of diet soda consumed, the higher the risk for becoming overweight or obese. The likelihood of becoming overweight was increased by 65 percent, and obese by 41 percent for each diet soda the participants drank per day. According to the same university, in 2011 another study was performed using 474 participants, aged 65 years or older and found that diet soda drinkers as a group had 70 percent greater increases in waist circumference than non-diet soda drinkers over ten years. 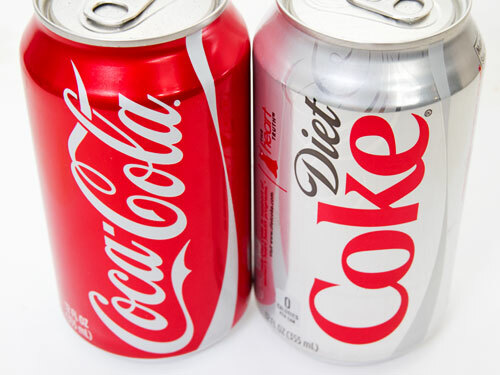 Those that were considered high diet soda drinkers (two or more per day) had a waist circumference increase of 500 percent greater than non-diet soda drinkers. Here are some things to consider with this study. There is no discussion of lifestyle choices in regards to diet soda drinkers vs. non-diet soda drinkers. Typically those that abstain from soda all together are generally healthier people as a whole, which could lead to such a significant difference in waist circumference. However, there could be other reasons diet soda consumption may not aid in weight loss. There is the possibility of a disconnect in the brain between the taste of artificial sweeteners and their lack of calories. The brain anticipates the body will need to digest calories upon tasting artificial sweeteners, but because there are no calories the body is simply thrown off. One study found that when rodents consumed non-caloric sweetener in yogurt, they consumed more calories, gained more weight, and put on more body fat compared to those consuming yogurt with sugar. Besides the potential for affecting weight, diet soda has also been linked to increasing other health risks, including diabetes. A study published in 2013 from the American Journal of Clinical Nutrition found that both sugar-sweetened and artificially sweetened beverages were associated with type 2 diabetes risks in women, and the diet beverage drinkers carried the greatest risk. Take home message. There is research arguing both sides for and against diet soda consumption. However, more research is emerging against diet soda consumption due to increased risks of health problems and weight gain. Therefore, drinking regular or diet soda often may not be the best choice, and it might be a good idea to cut back on both beverages and choose water, unsweetened iced tea or coffee, or sparkling water instead. So What should I buy? Here is a list of spreads to try! Note: Even though a band name might be on this list, that does not mean that every spread they make is healthy, so always check the nutrition labels.